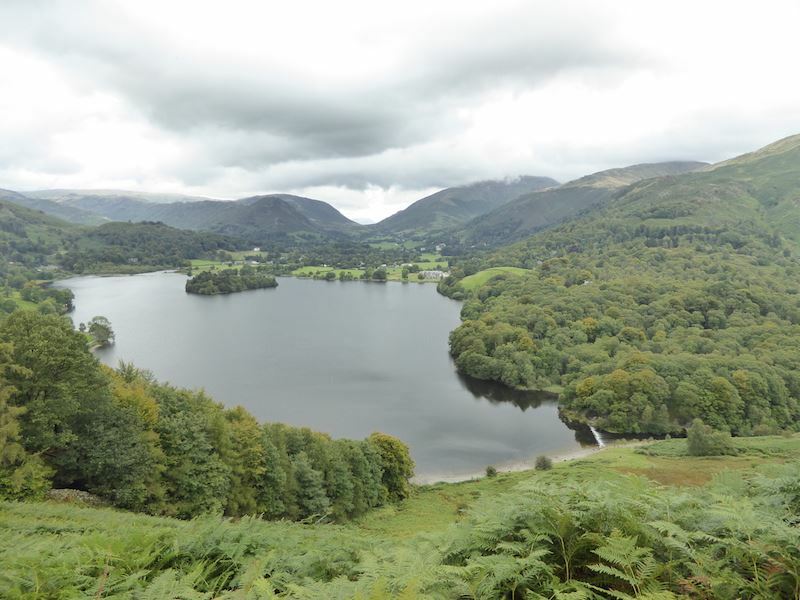 Weather – cloudy and dull at first, sunnier later. 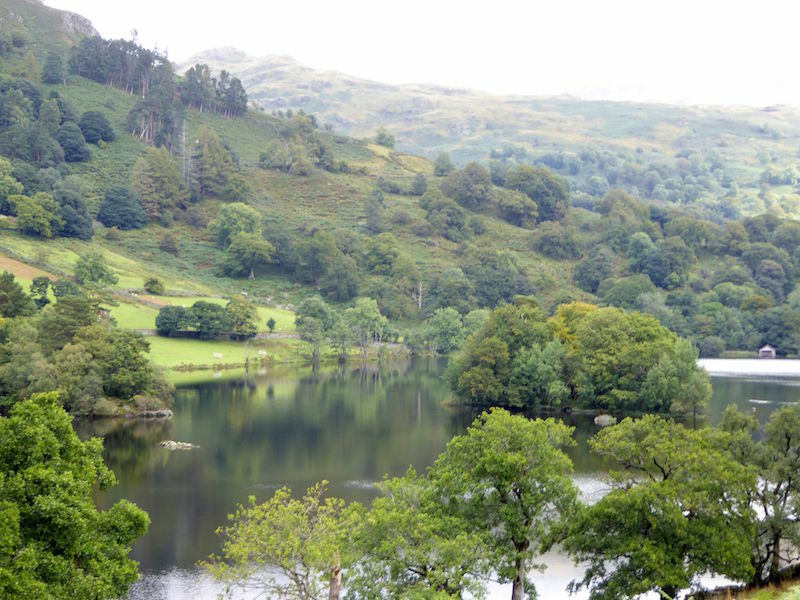 Rydal Water on a rather grey morning. 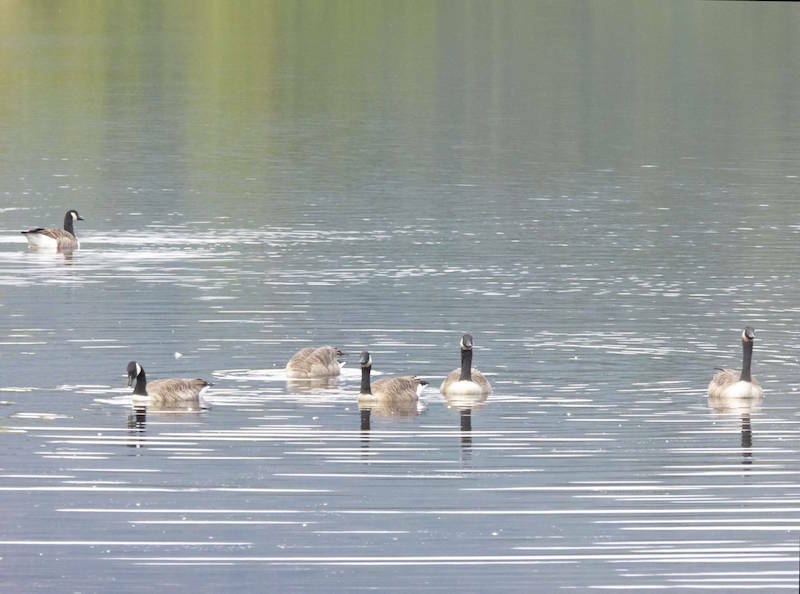 A close up of the Canada Geese on Rydal Water. 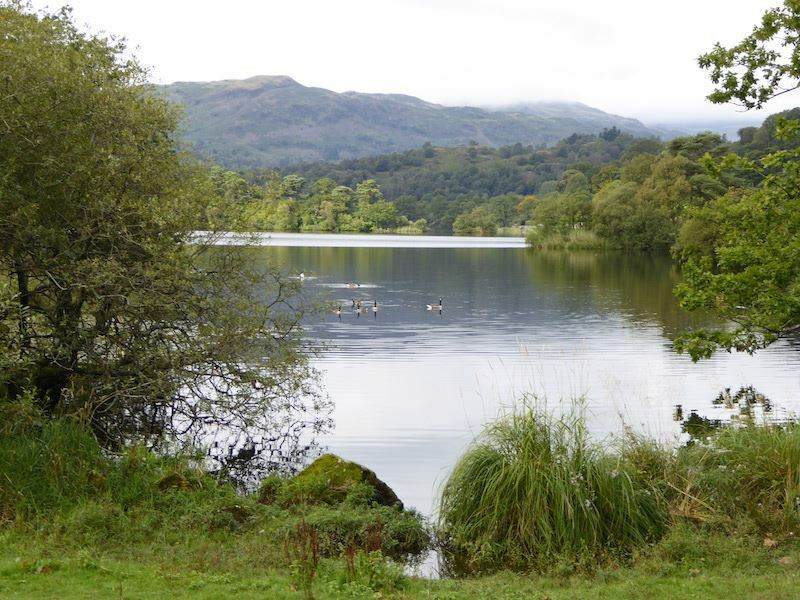 All is quiet on Rydal Water this morning. 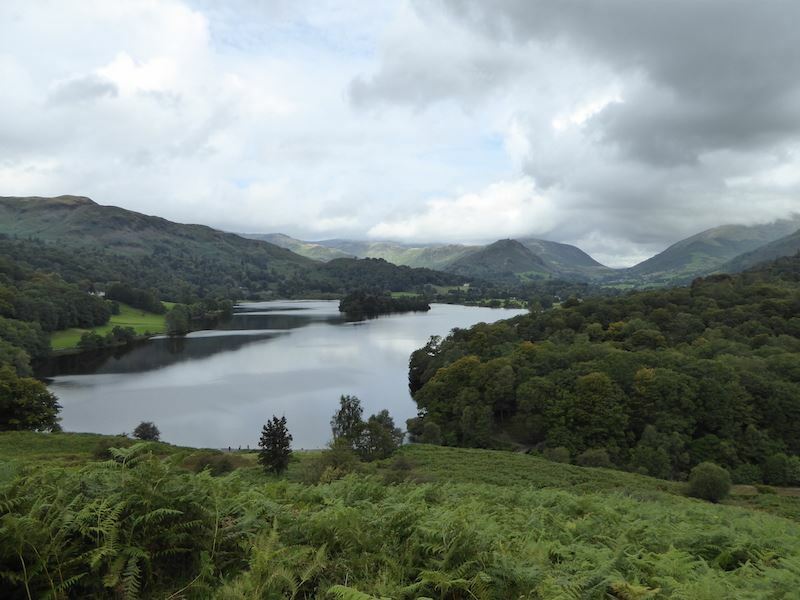 Shades of silver on Grasmere below Silver How. Lots of cloud activity and changes of light this morning. 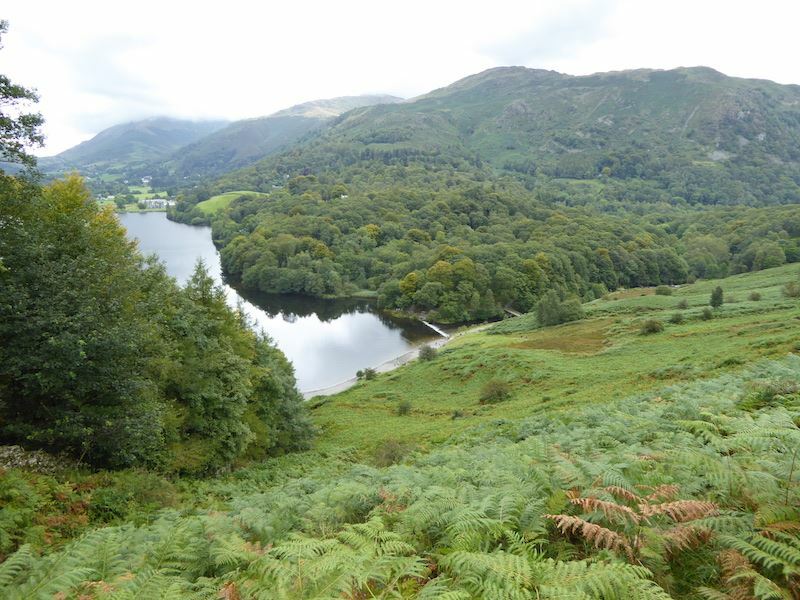 This is looking northwards over Grasmere. 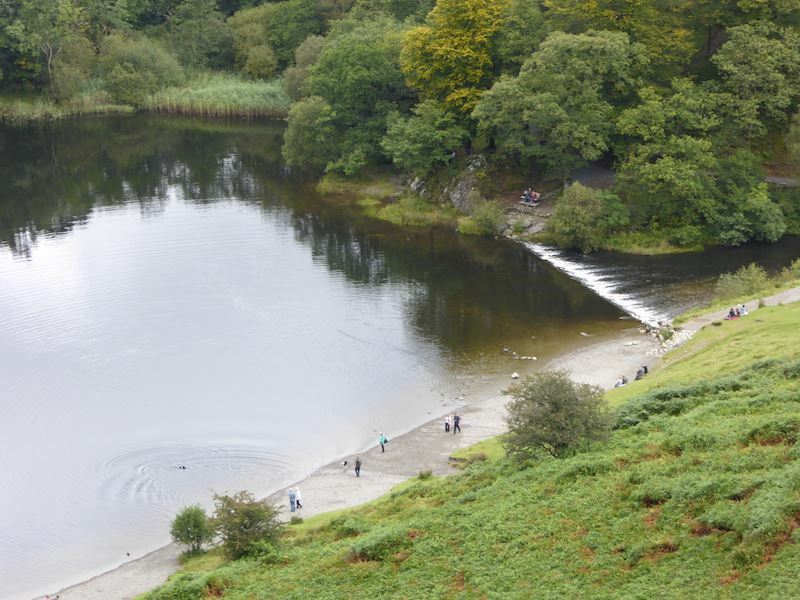 Looking down at the weir at the bottom of Grasmere from the terrace path on Loughrigg Fell. A close up of the weir, lots of people around this morning but nobody, except dogs, swimming today. 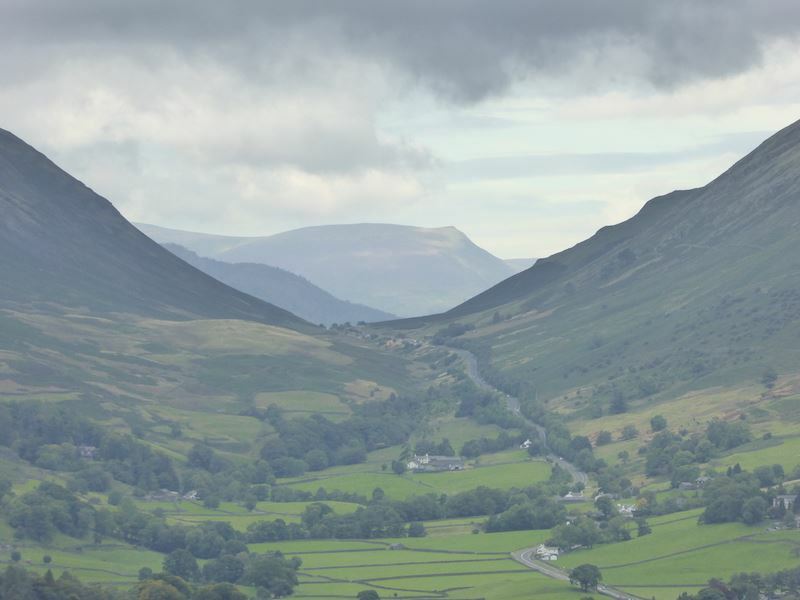 Looking at Steel Fell and Seat Sandal on either side of Dunmail Raise (the U shaped notch in the centre) and noticing that the cloud seems to be lifting, or is that just wishful thinking. 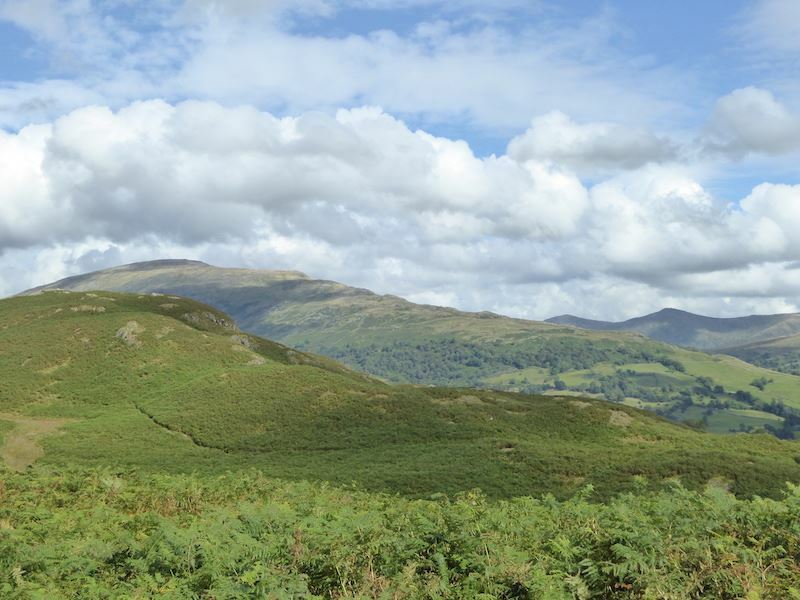 Zooming in to show Dunmail Raise with Lonscale Fell on the centre horizon. 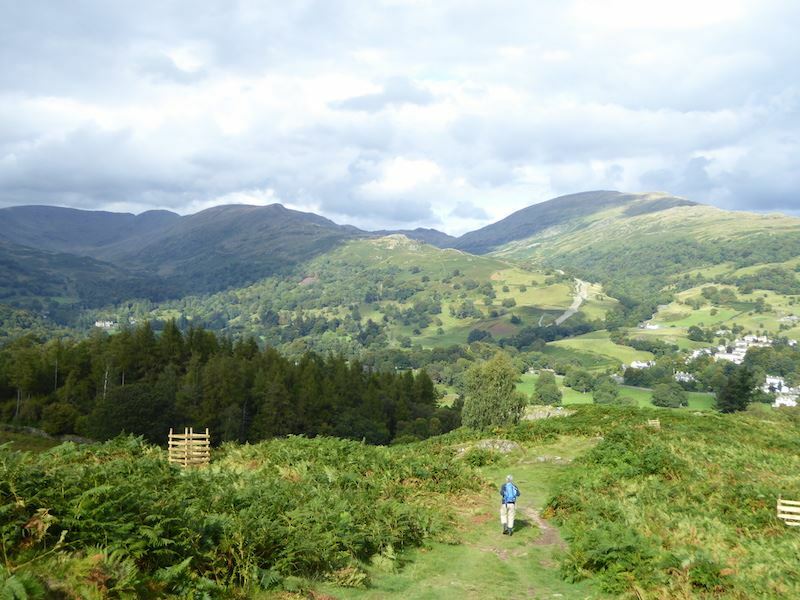 Looking back down the path we are taking up to the summit of Loughrigg. 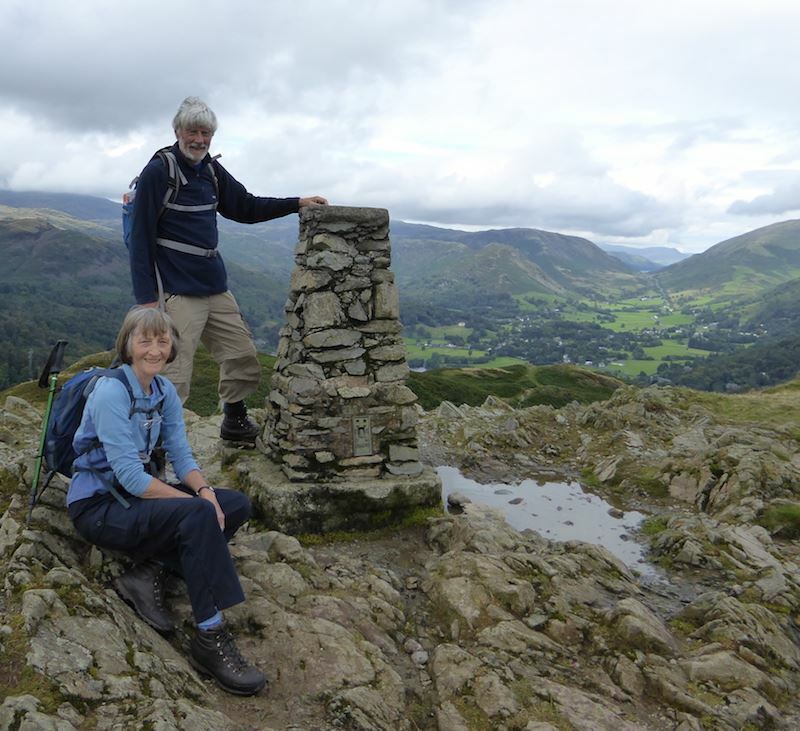 The trig point is just ahead of us so just a short way to go now. 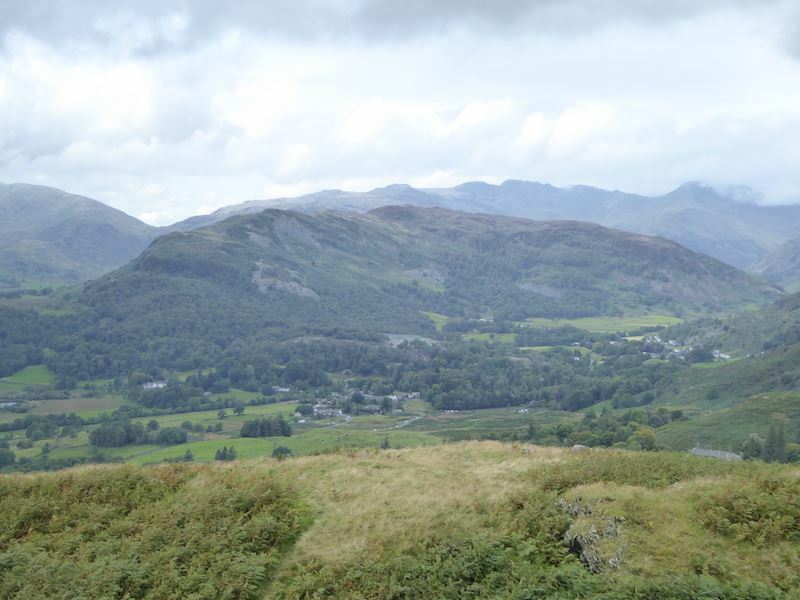 From the summit a view down to Elterwater and a rather hazy view of Wetherlam behind it. 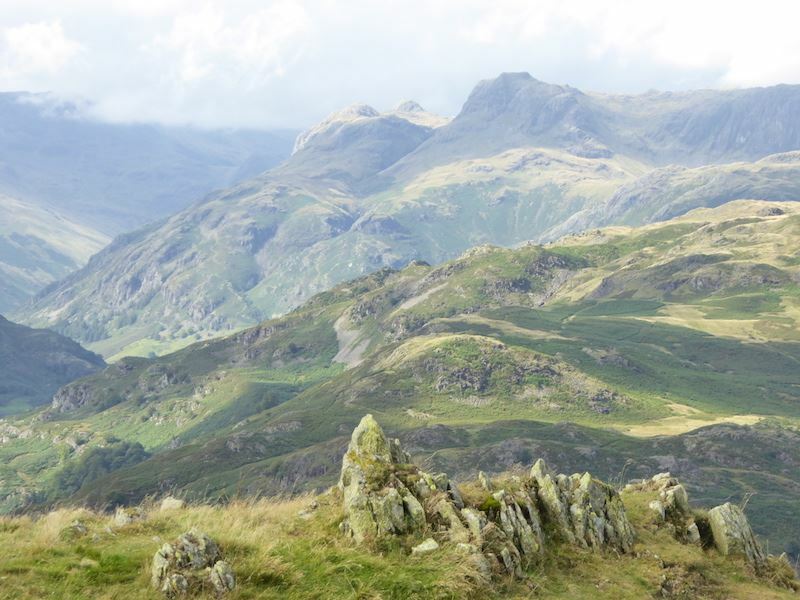 Lingmoor Fell in the centre, Crinkle Crags behind it and a cloud capped Bowfell over on the far right. Beyond Silver How the cloud is still clinging on to the higher fells. 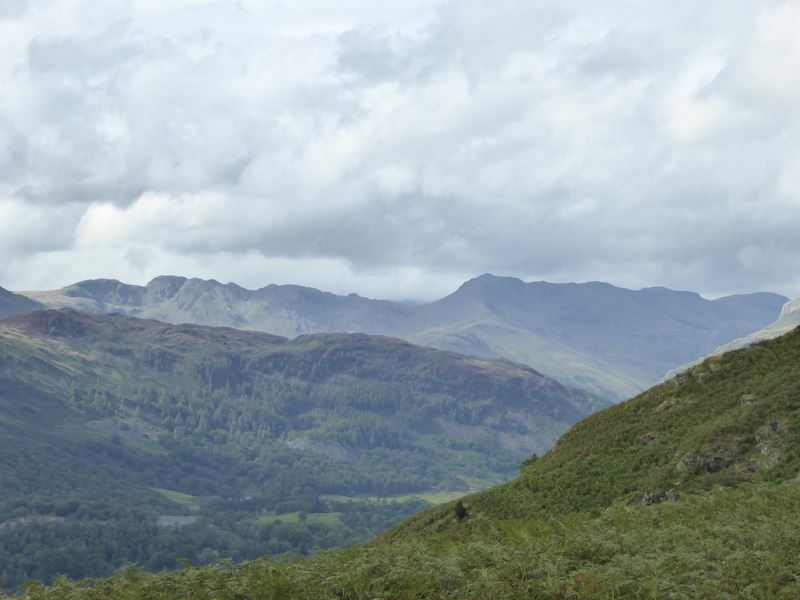 Crinkle Crags are now mostly cloud free. 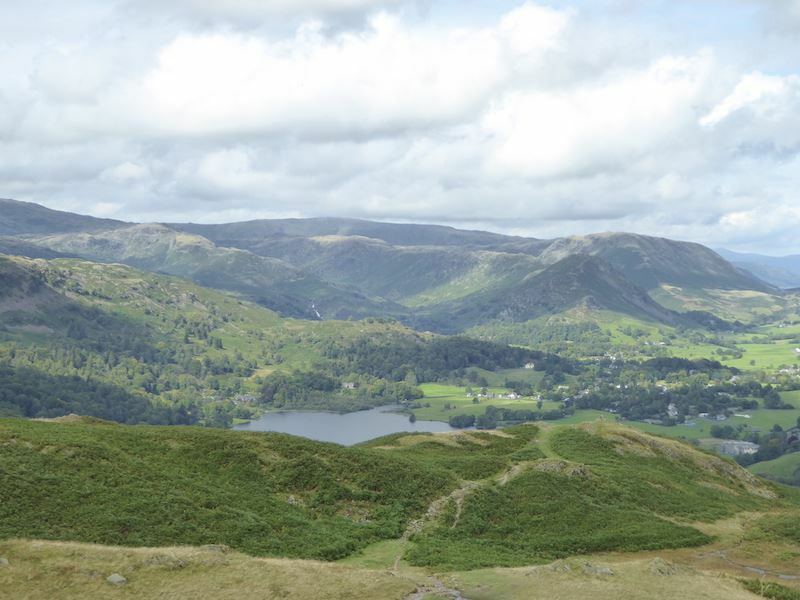 On Loughrigg summit with a view northwards. Blue sky is definitely starting to appear. 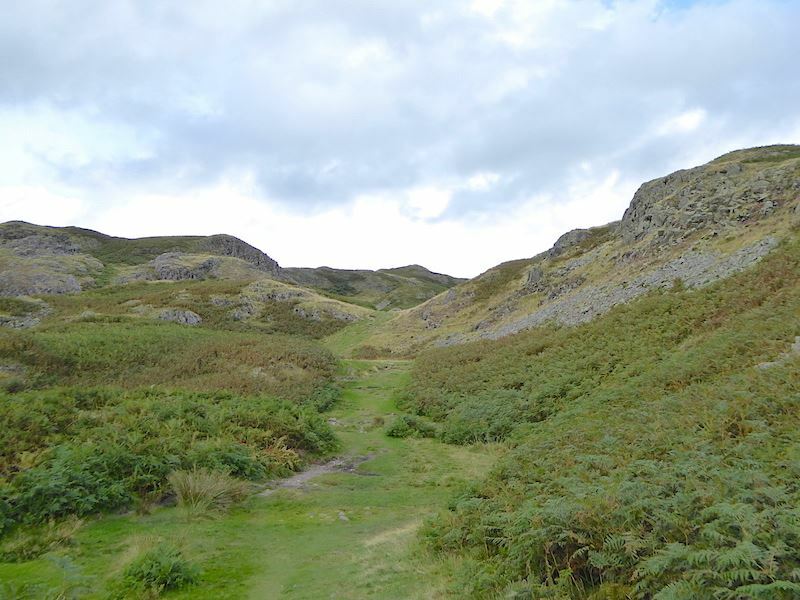 Straight in front is Heron Pike which leads down to Nab Scar on the right. 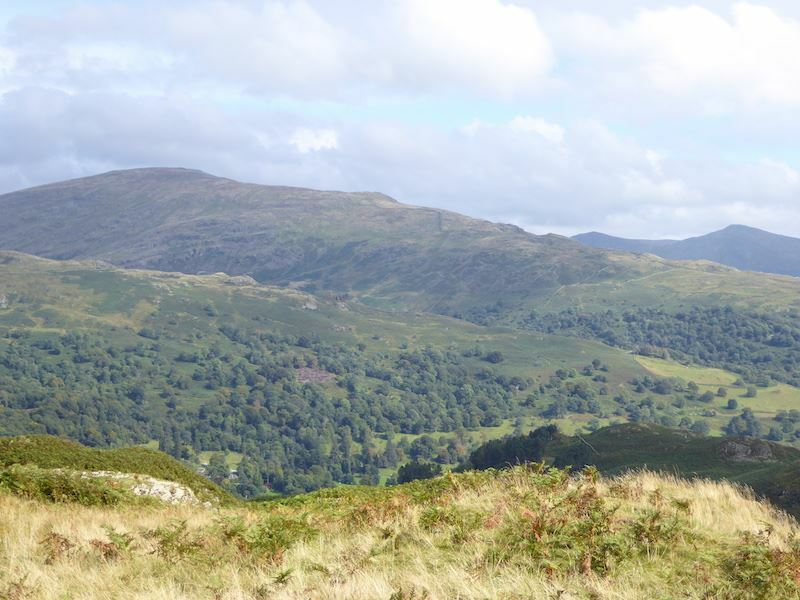 These two are part of what is known as ‘The Fairfield Horseshoe’. 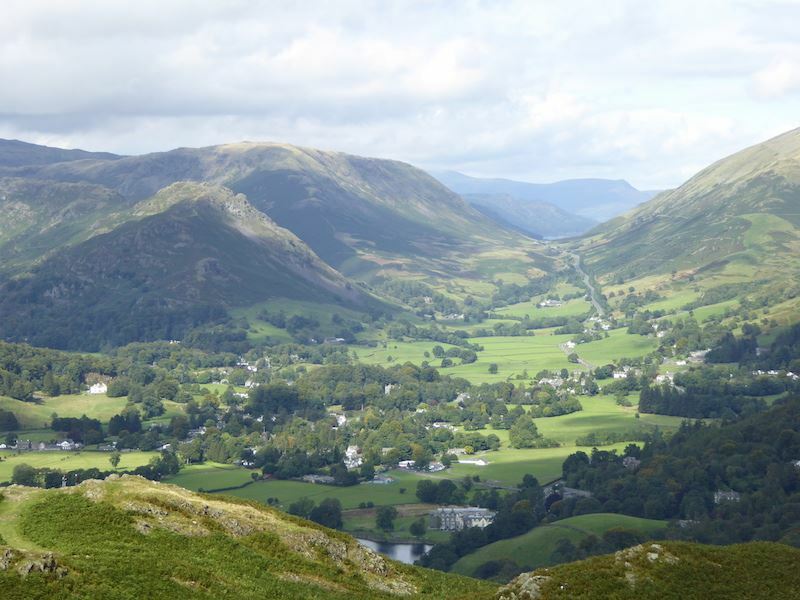 The other fells in the horseshoe are behind them. 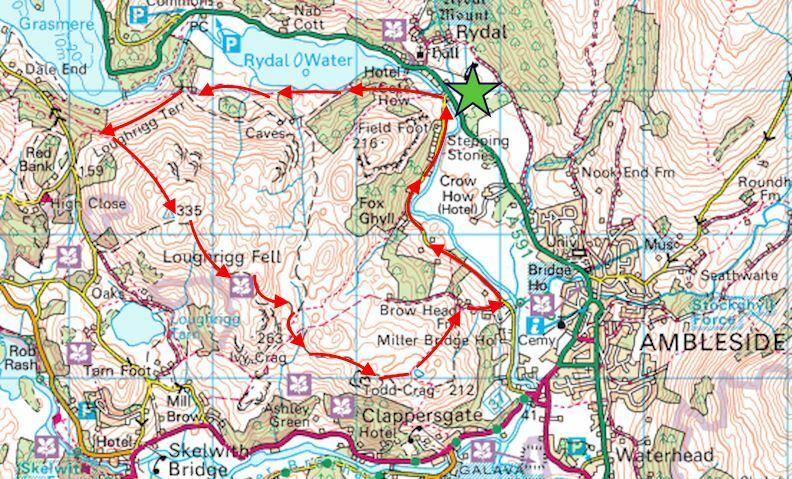 On the skyline the ridge runs down from Dove Crag to High Pike and then on to Low Pike. 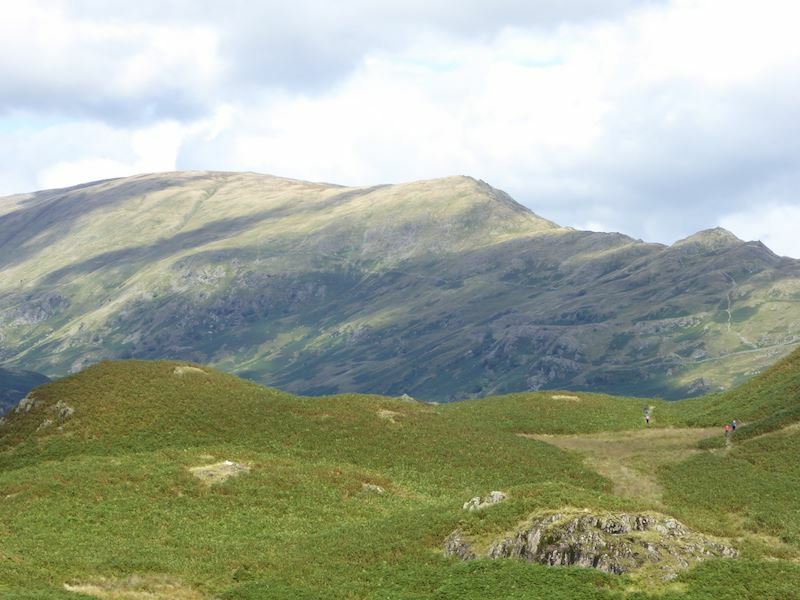 Running diagonally across the shot is Red Screes, the summit is over on the left. 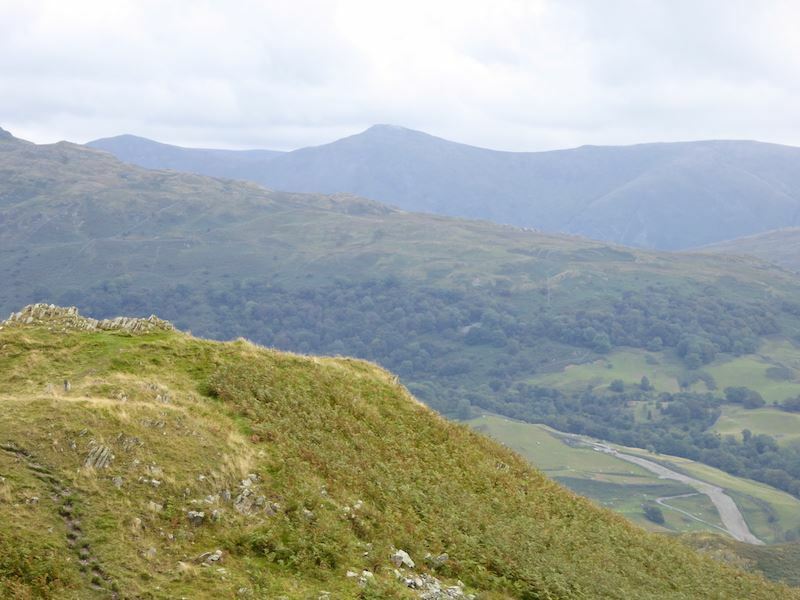 Beyond the lower end of the Red Screes ridge there is a view of Froswick, Ill Bell and Yoke over on the horizon. 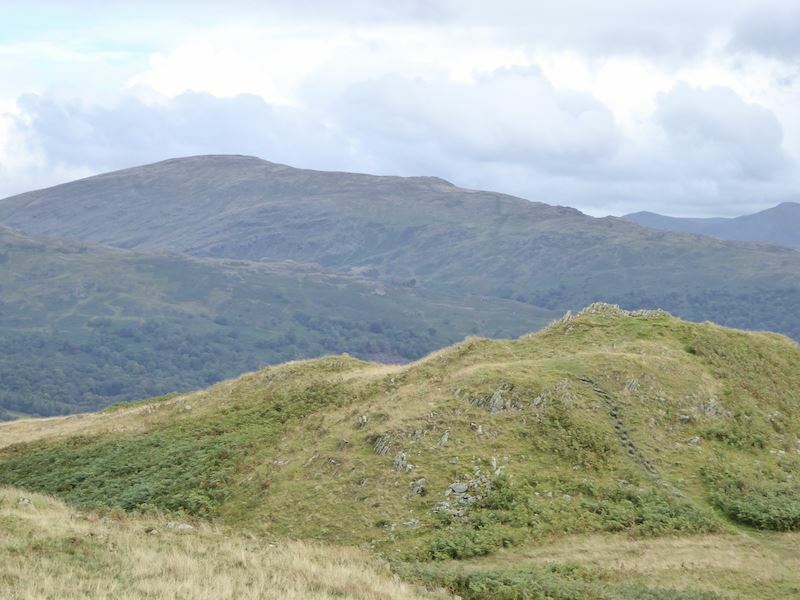 Those three form part of ‘The Kentmere Horseshoe’. 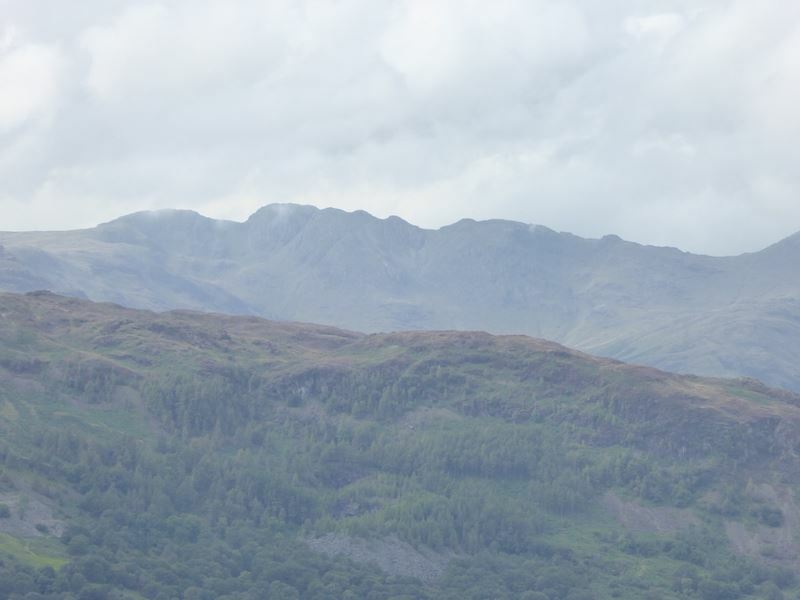 That’s Wetherlam over there and the sky is definitely getting brighter. It was covered in cloud a few shots ago. 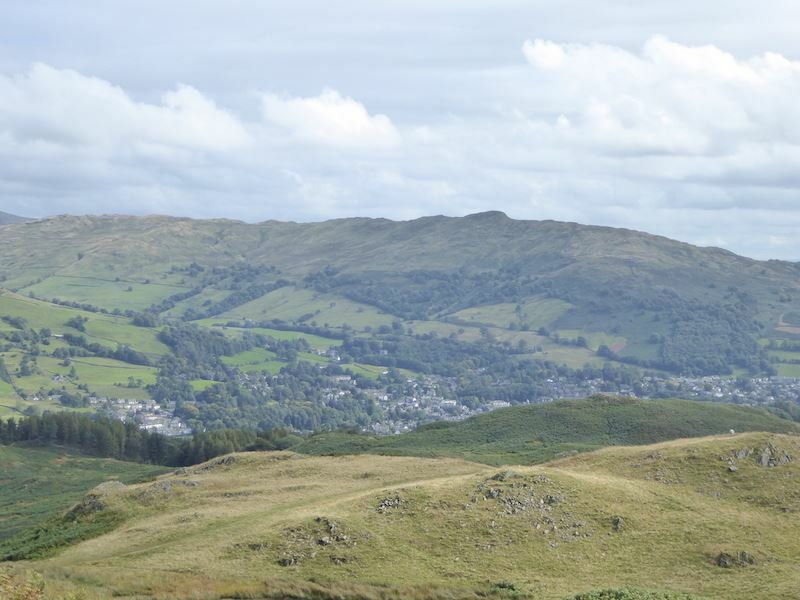 Down there is Ambleside and beyond it is Wansfell. 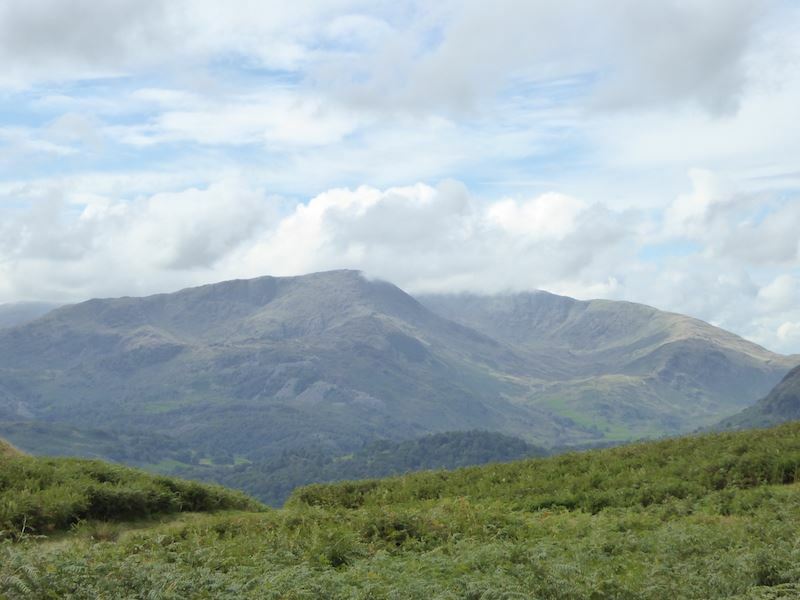 All of a sudden its turned into a different day as the fells become clearer in the sunshine. 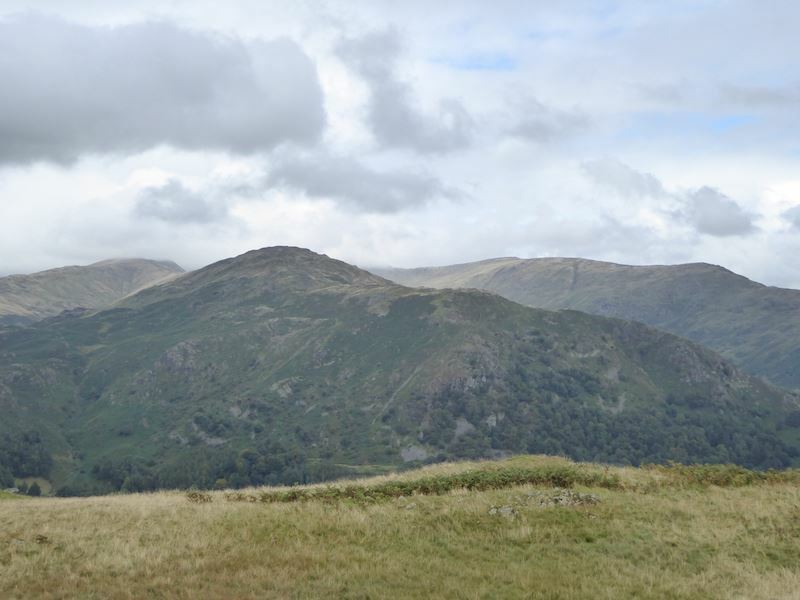 The fell in the centre with the peak in the shade is Great Rigg and its long sloping ridge down to Stone Arthur. 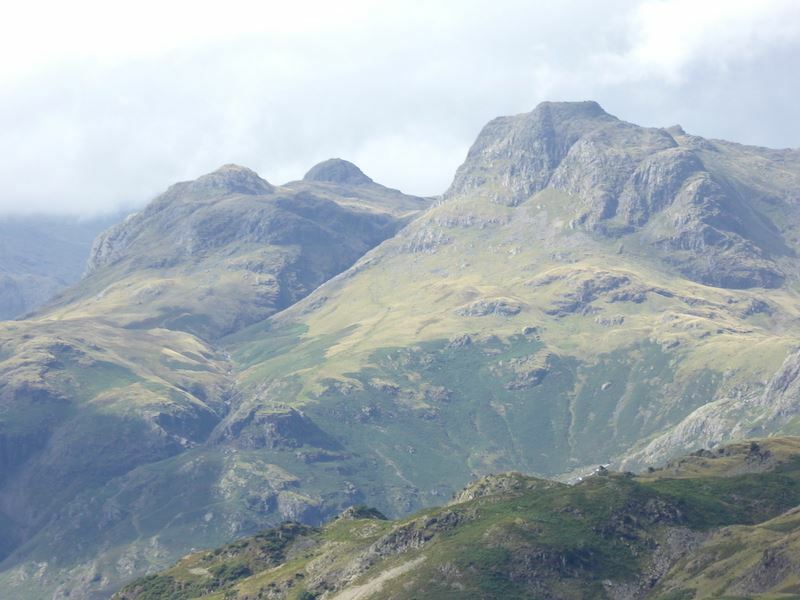 The Langdale Pikes in close up, they look quite formidable don’t they? I zoomed out a little to show the pikes and their surroundings. 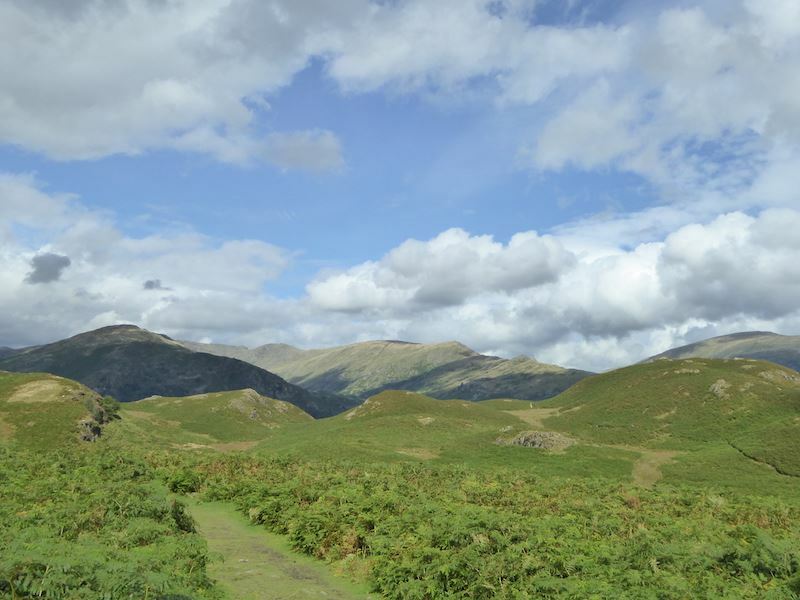 Looking towards Dunmail Raise again, Helm Crag to the left of it with Steel Fell behind that. 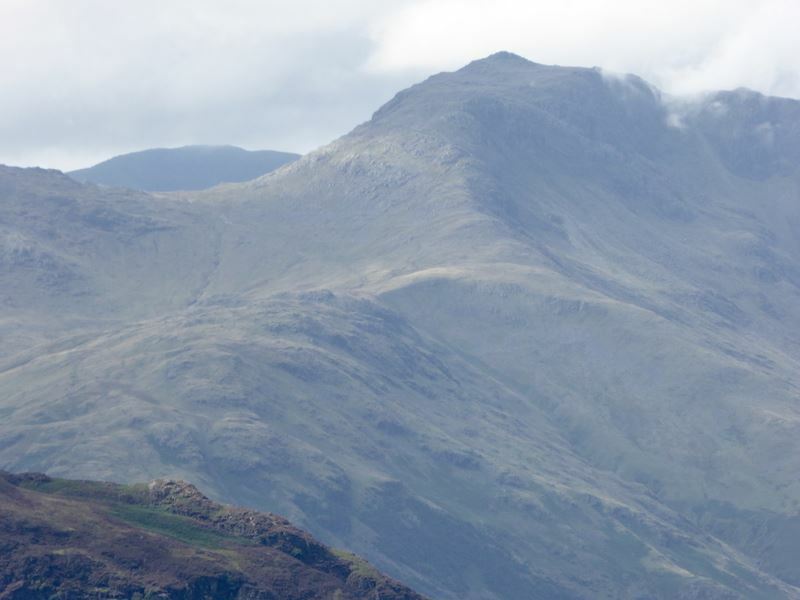 A close up of the mighty Bowfell. 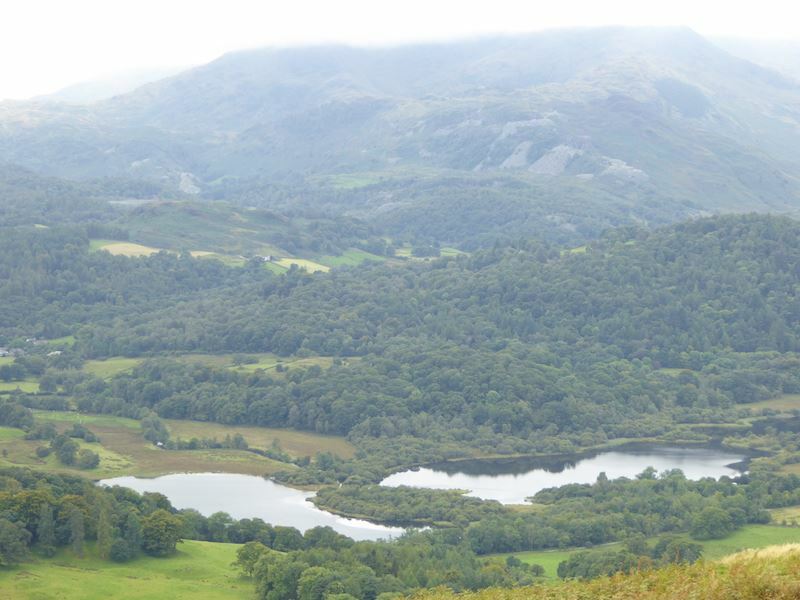 A look back at the summit of Loughrigg as we leave. 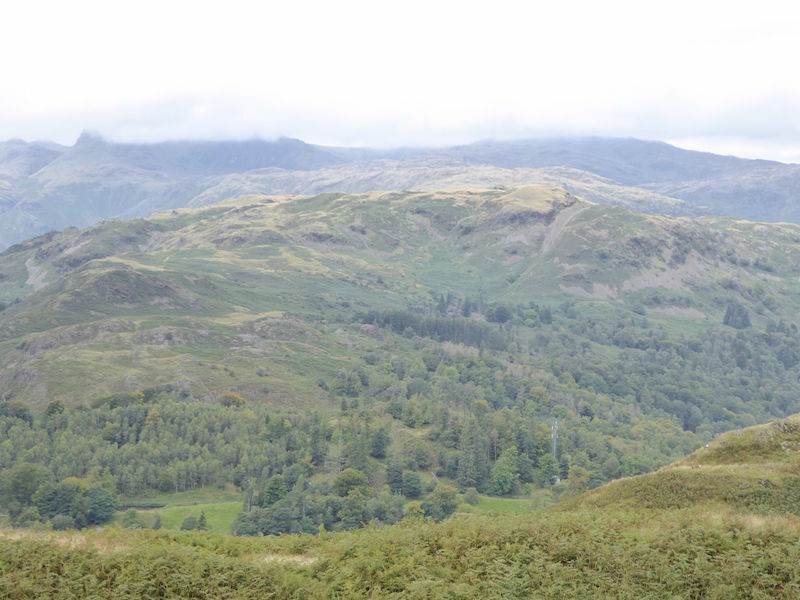 Looking over at the now very clear view of Crinkle Crags on the left and Bowfell on the right. 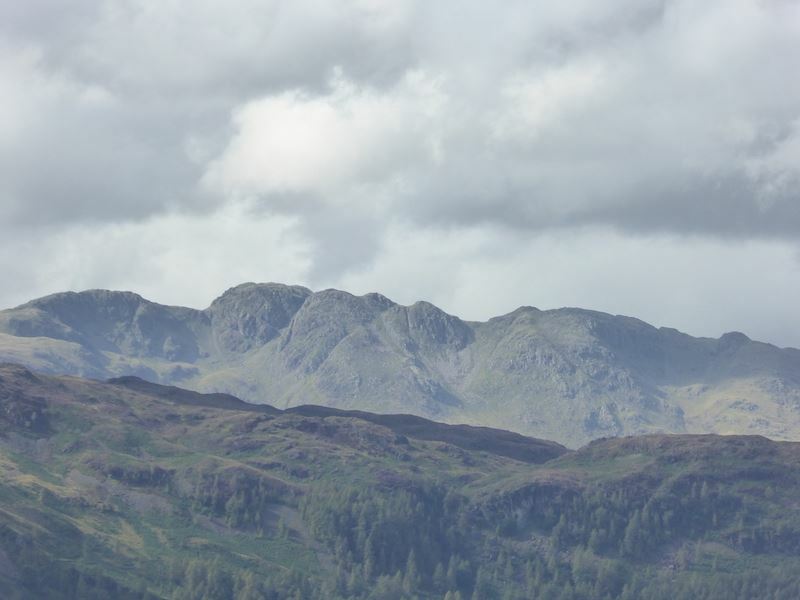 Sunny Crinkle Crags in close up. 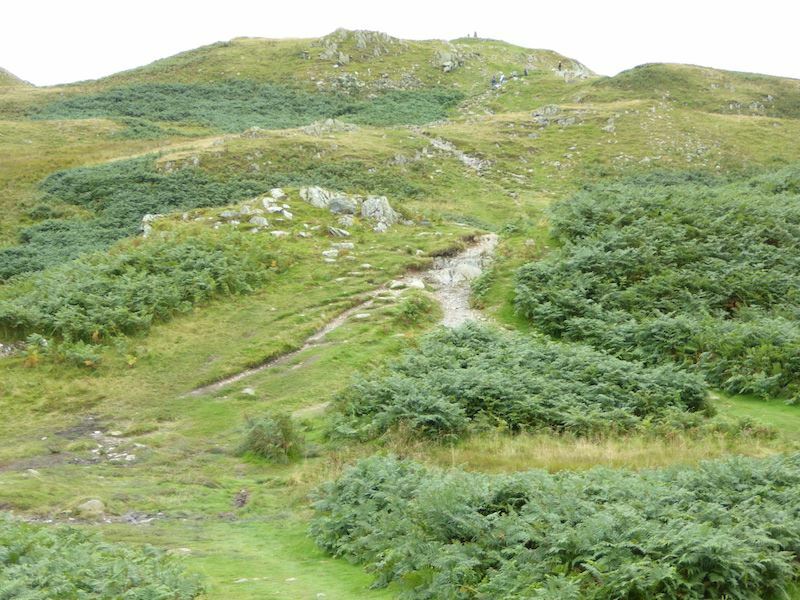 Continuing along one of the many paths on Loughrigg. 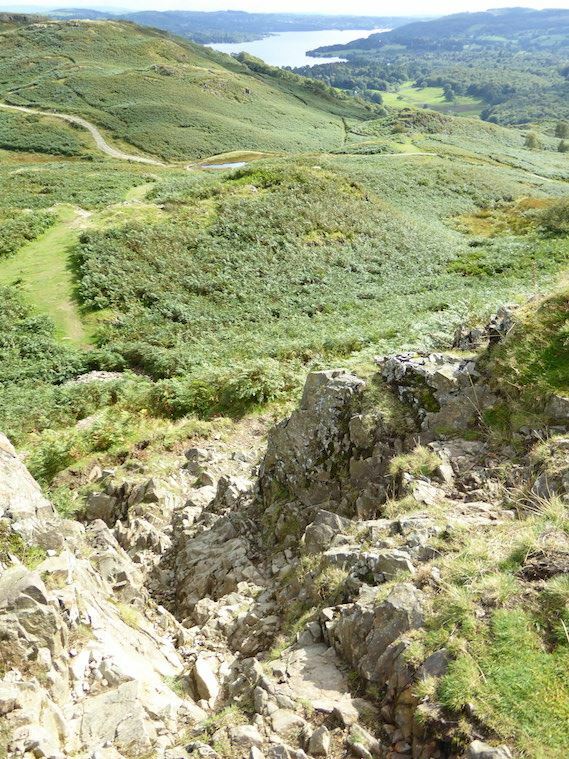 You could spend a whole day on Loughrigg as there’s lots to explore up here. 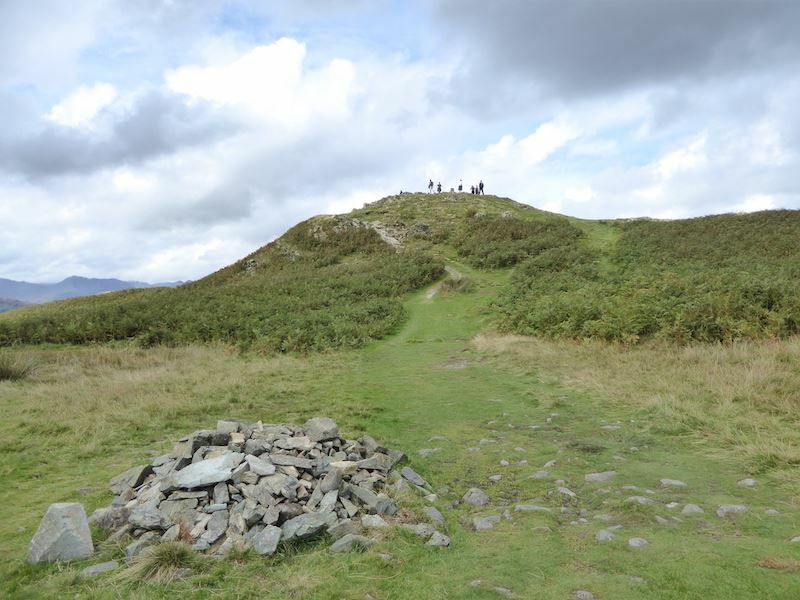 Another look back at the summit, that’s it smack in the centre of the skyline. 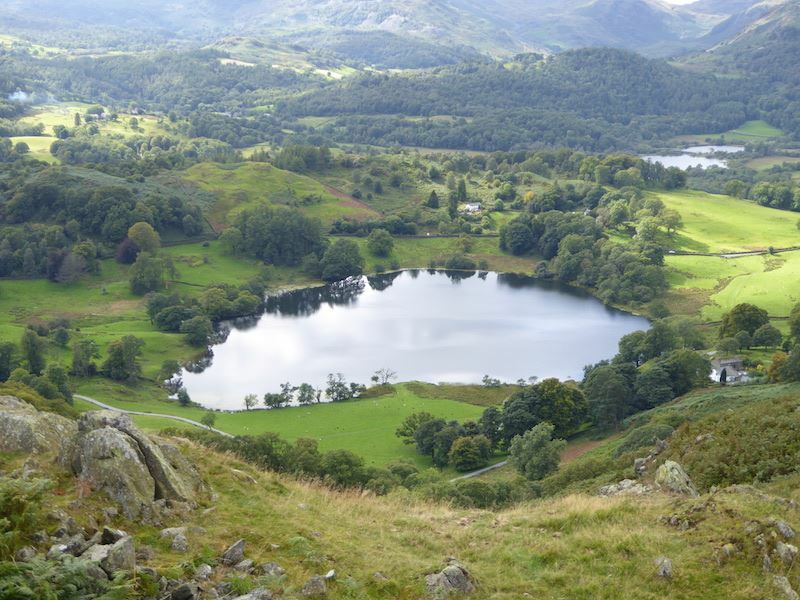 One of the vantage points gives a grand view of Loughrigg Tarn, a popular spot although it doesn’t look like it today. Hmm, this could be one of those occasions where a fifth point of contact might be needed! 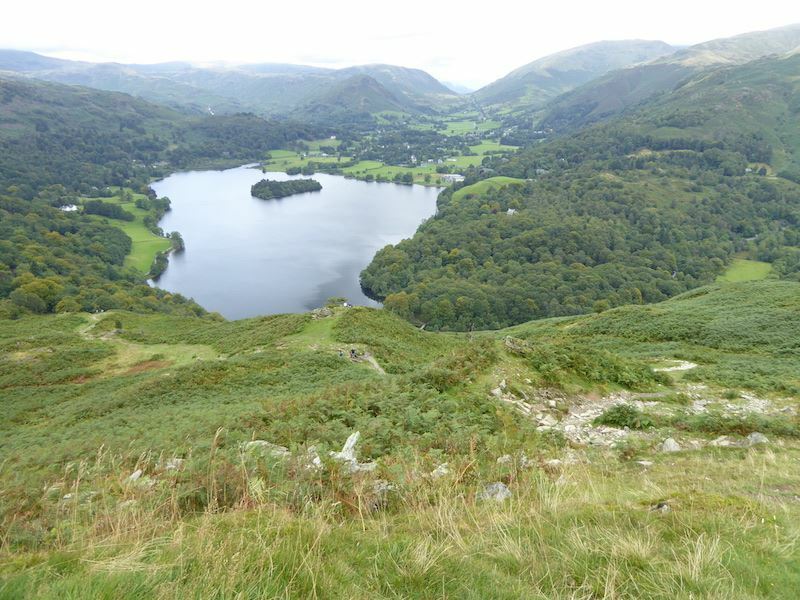 From here you have a view of almost the whole of The Fairfield Horseshoe. 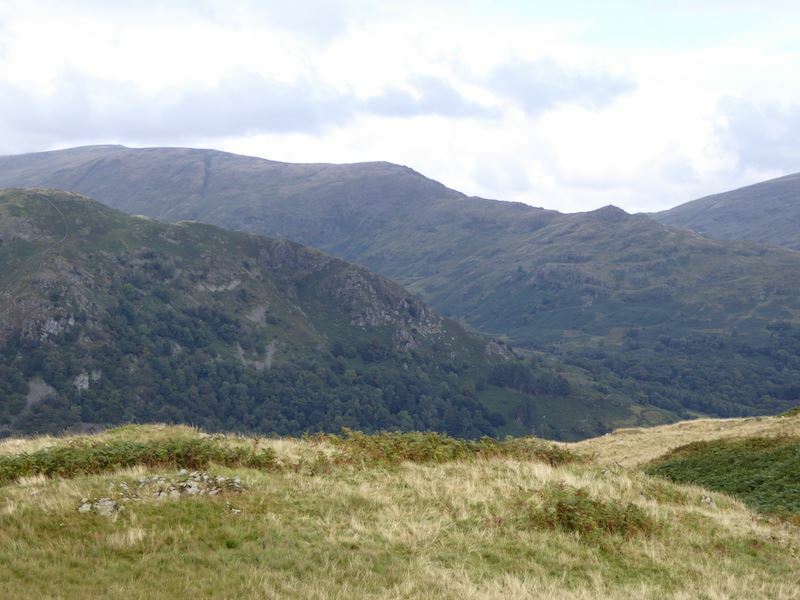 Red Screes in close up. 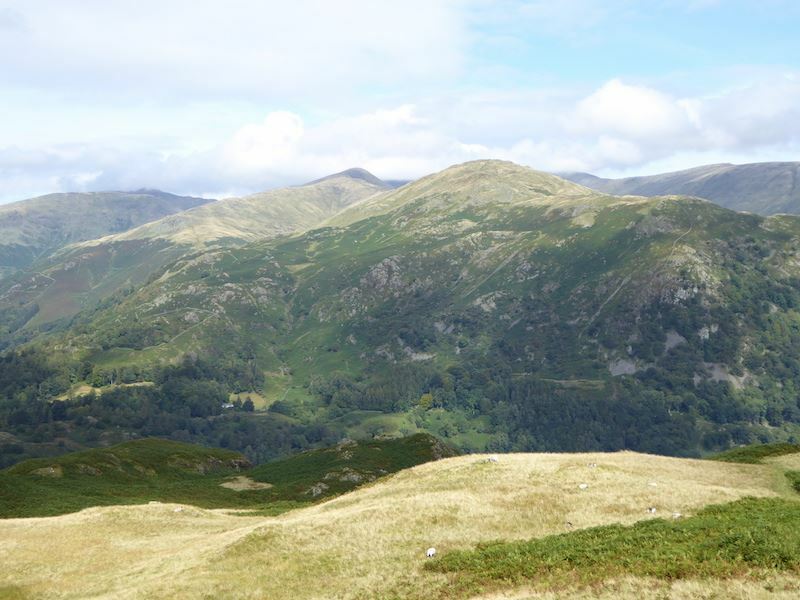 The Dove Crag, High Pike and Low Pike section of the Fairfield Horseshoe. 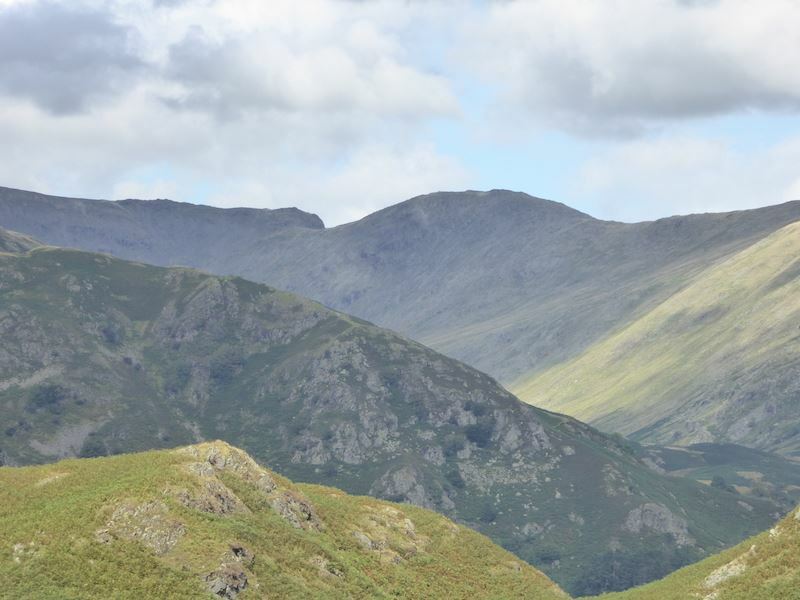 Sunlight dappling the ridge of Red Screes in the middle foreground. 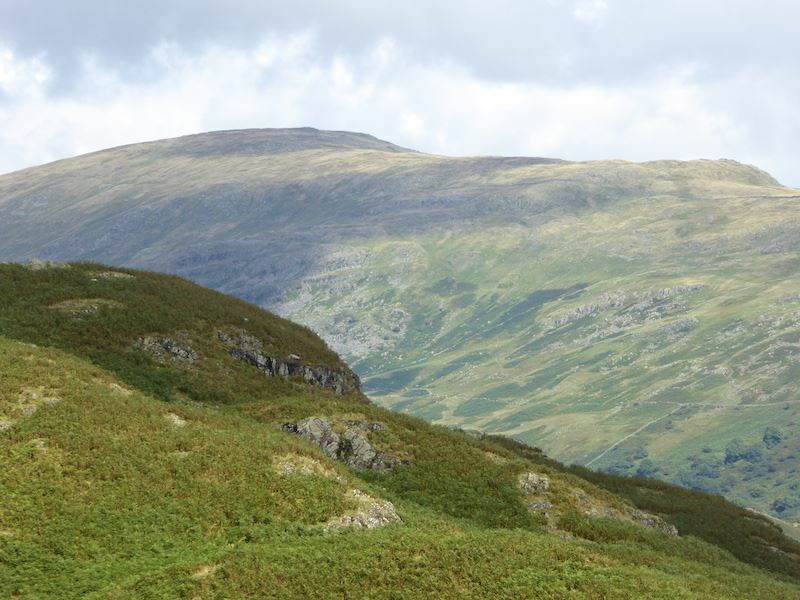 The fell with the curved shape on the centre skyline is Hart Crag which leads on to Fairfield, on the left. 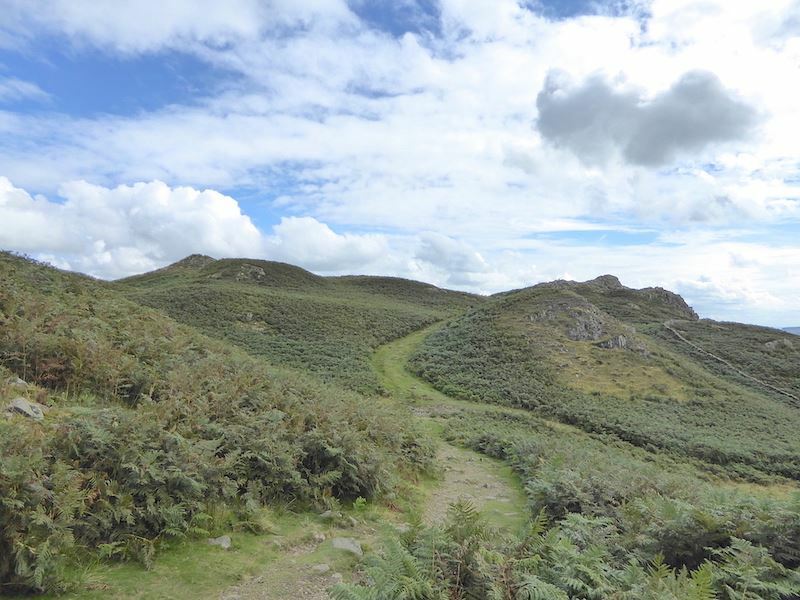 Fairfield stands at the head of the Horseshoe, so you’re roughly at the the mid-point when you get to it whichever end you started from. 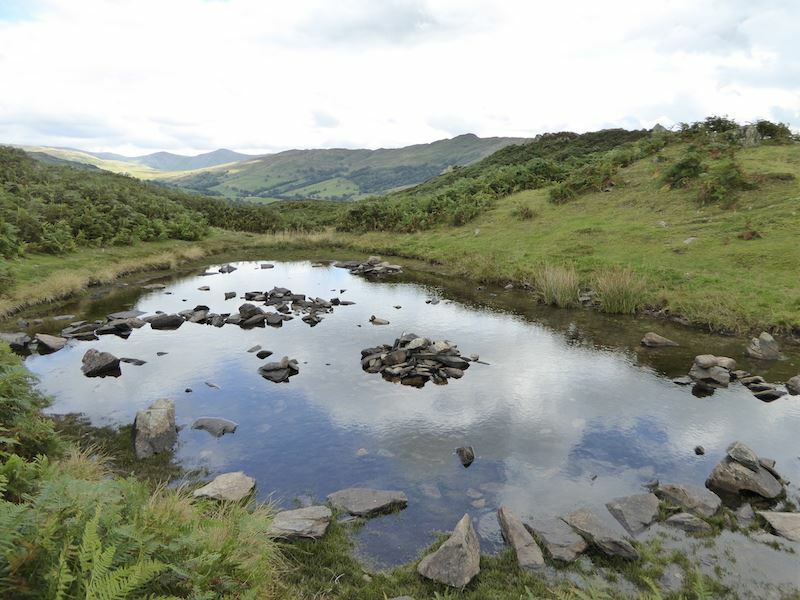 Just one of the many little pools and tarns to be found on Loughrigg. 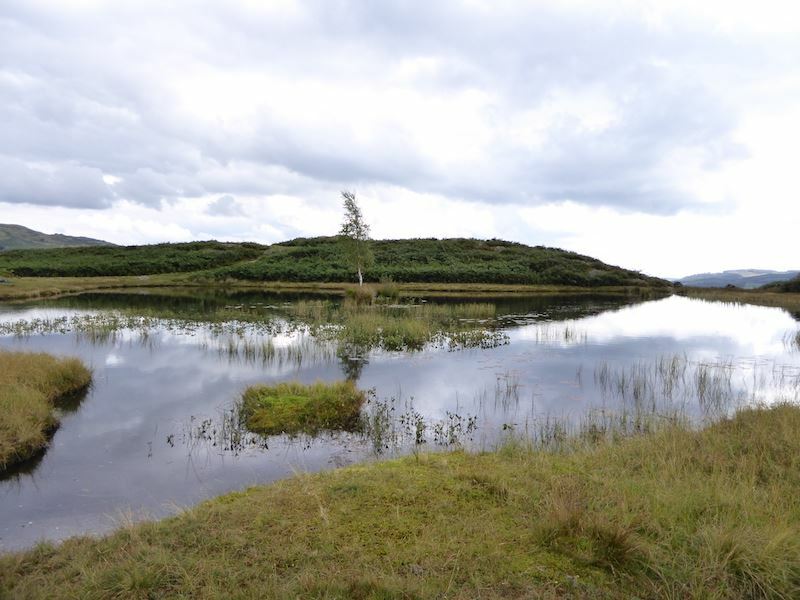 This one is quite close to Lily Tarn. 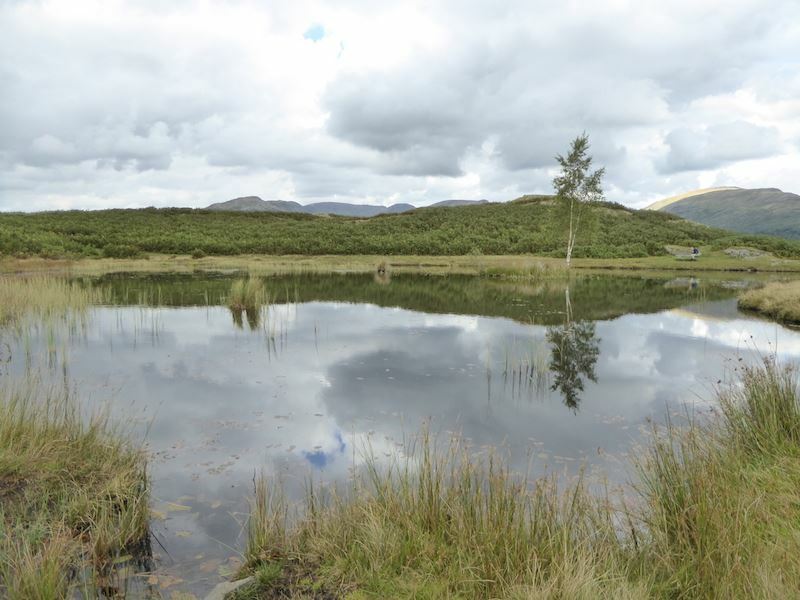 Lily Tarn from the other side. 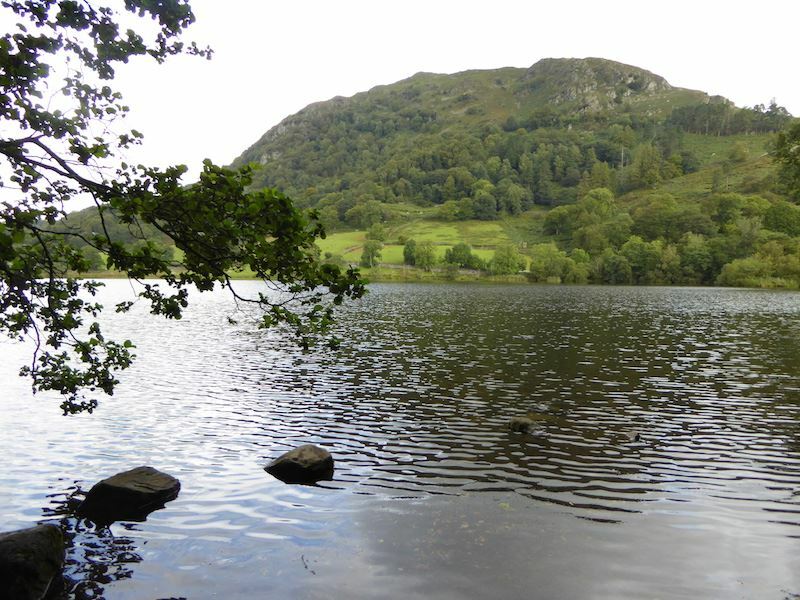 Its a lovely quiet little spot. I waited a while for the cloud to move over but it refused to do so, it made for some interesting reflections though. 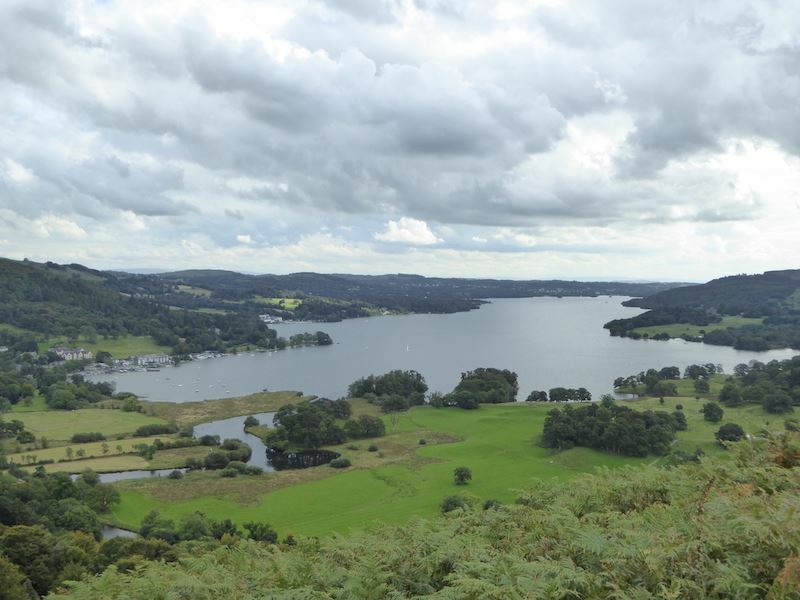 A splendid view of Windermere as we continue our descent. The blue of those hydrangeas caught my eye as we walked along. 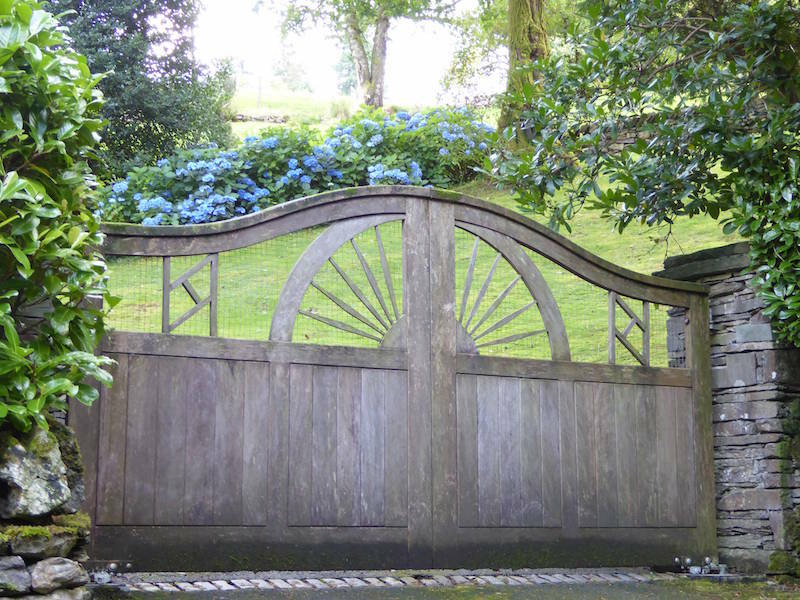 The gates of Fox How. 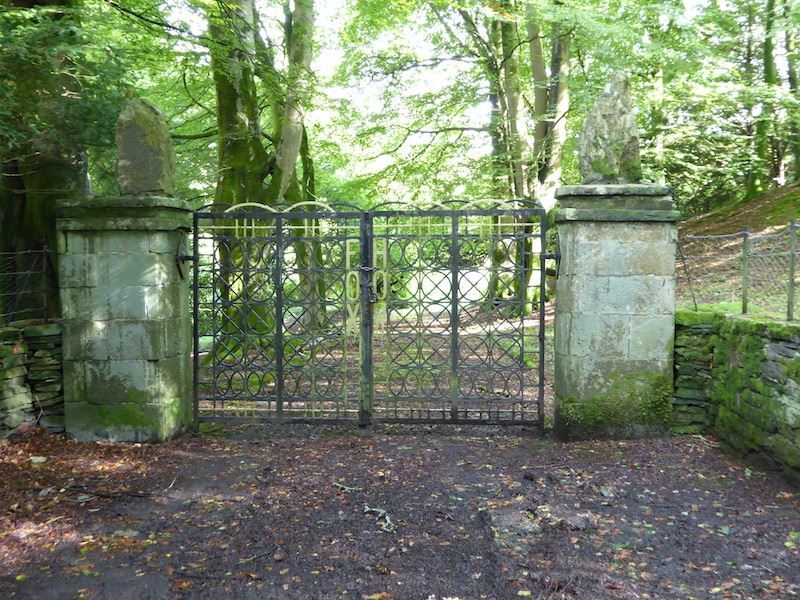 Those gates had intrigued me so I did a little research. 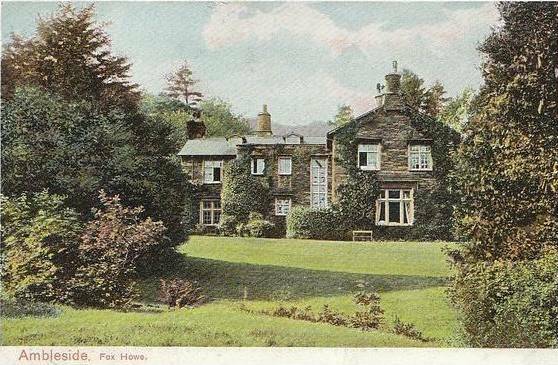 This old postcard shows the house that the gates are the entrance to. I didn’t see the house at the time so it must have been hidden in the trees. The man who built Fox How, Dr Thomas Arnold, the famed headmaster of Rugby School. 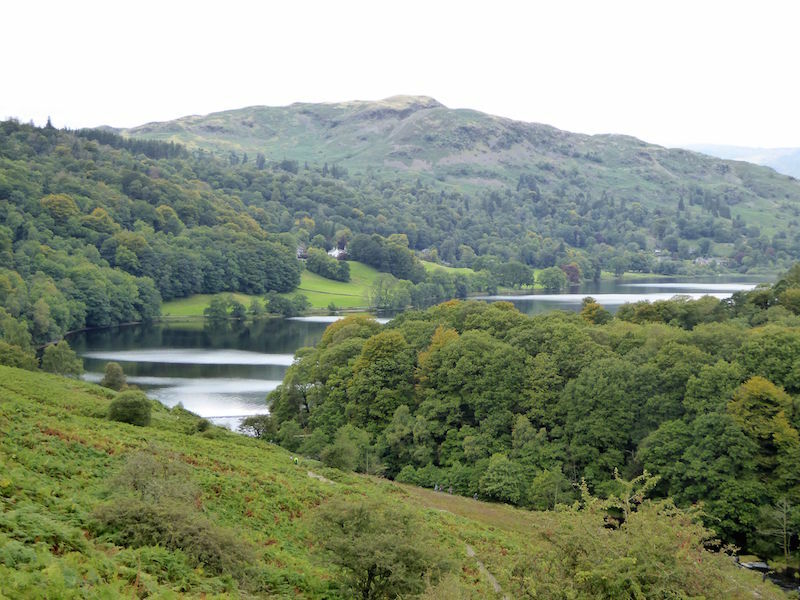 was encouraged by William Wordsworth, to buy land and build a holiday home near Ambleside. The house was completed in 1833. A grand-daughter of Dr Arnold described the house as ‘a modest building, with ten bedrooms and three sitting rooms’. Wonder what she thought large was? 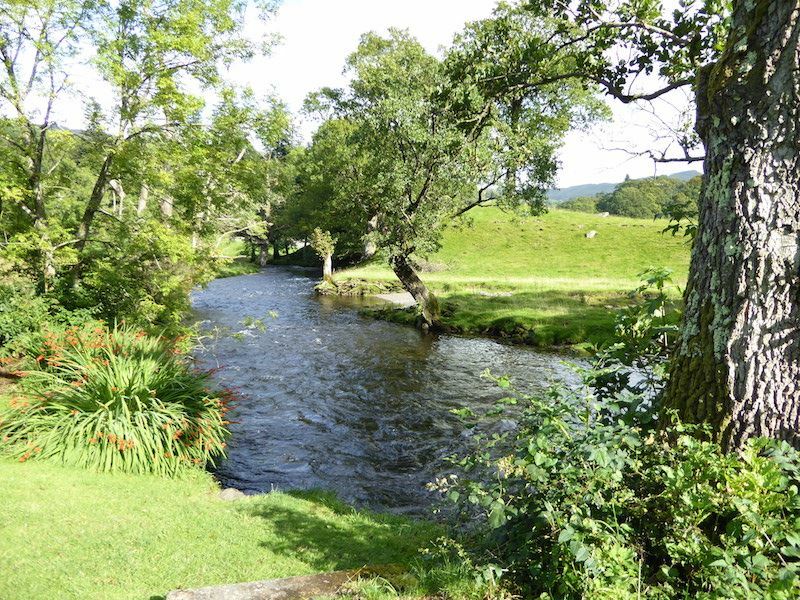 We ended our walk with a very pleasant stroll in very warm sunshine beside the River Rothay back to Pelter Bridge, so it was definitely a day of two halves as far as the weather was concerned. Shame it wasn’t like this from the start, it would have made such a difference to the photos.